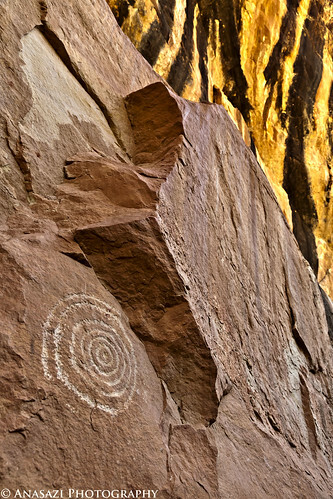 A unique perspective of a concentric circles petroglyph found in Mule Canyon. While exploring the ruins and rock are in this particular alcove I happened to notice the light was reflecting onto the top portion of the large alcove creating a nice glow and enhancing the dark stripes above. I then framed this petroglyph so that I was able to capture part of the glowing ceiling in the top right portion of the frame. I’m very happy with the result.